Get London Fire Brigade essential facts below. 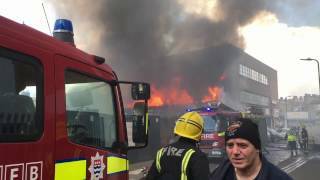 View Videos or join the London Fire Brigade discussion. 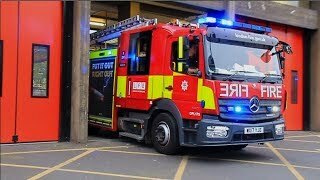 Add London Fire Brigade to your PopFlock.com topic list for future reference or share this resource on social media. 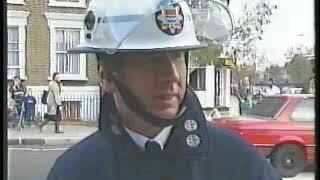 The 2004 Act was drafted in response to the Independent Review of the Fire Service, often referred to as the Bain Report, after its author Professor Sir George Bain. 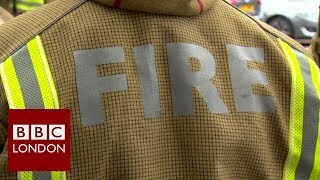 It recommended radical changes to many working procedures and led to a national firefighter strike in 2002-2003. The London Fire Brigade, along with many UK fire and rescue services has adopted a change in rank structure. The traditional ranks - to the left of the column below - have been replaced in the LFB, by new titles more descriptive to the job function. 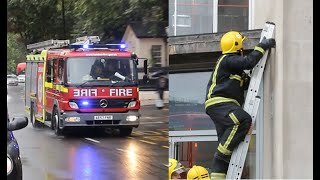 In the last 24 months the LFB have run 3 firefighter recruitment campaigns, however in previous years have seen fewer or even none. There are many factors as to why they would run a recruitment drive, as there is actually no set recruitment drive for firefighters. Professional firefighter training usually takes place at various London venues. On successful completion, the newly qualified firefighter is posted to a fire station to work on a shift pattern - currently two day shifts (ten and half hours), followed by two night shifts (thirteen and half hours), followed by four days off. Working patterns were the subject of scrutiny in Professor Bain's Independent Review of the Fire Service. After training school, firefighters serve a one-year period of probation; qualification and full pay are not reached until the candidate completes a development folder which usually takes around 12-18 months. Ongoing training - both theoretical and practical - continues throughout the firefighter's career. 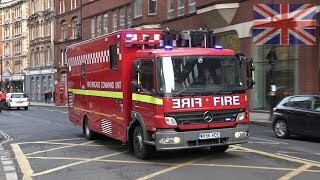 In December 2010 the LFB and Fire Brigades Union (FBU) agreed on a new shift pattern for front-line firefighters: two 10-hour day shifts then two 13-hour night shifts followed by four days off. If an incident is more serious, it can be escalated straight to a 6-, 8- or 10-pump fire and beyond - in London this is usually completed in even numbers, though it is not uncommon for a 10-pump fire to be 'made up' to 15 if necessary. A call to, say, a large warehouse ablaze could be escalated straight to a 10-pump fire. The 2007 Cutty Sark fire required 8 pumps; as a serious incident escalates, the brigade deploys senior officers, Command Units and any specialist appliances required. Core services are paid for by London's council tax payers and through central government funding known as a grant settlement; each council tax payer's bill will include a precept - a specific part of their bill that contributes to the funding of the fire brigade. 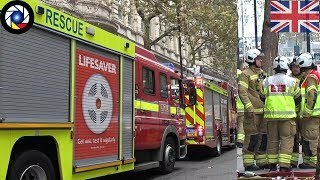 Those in need of the LFB's services in an emergency do not pay, but the brigade can provide additional special services for which it may charge where there is no immediate threat to life or imminent risk of injury. In response, the LFB signed a partnership contract with Babcock International Group PLC to provide firefighter training over the course of 25 years beginning in 2012. Babcock is also the number one training provider to the Royal Navy, which includes firefighter training. The improvement program for firefighting training will introduce two new dedicated training centres and upgrades to 10 regional training centres. 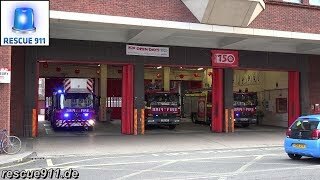 There will also be further improvements through additional computers and training facilities across many of the capital's 103 fire stations. The new firefighting training systems, supplied by Process Combustion Ltd, will have low environmental impact and will allow firefighter training to take place at night under simulated extreme conditions that firefighters will face on incident ground. In addition to improving training facilities, Babcock's proposals will increase the amount of time available for firefighter training and save the LFB an estimated 66m over the next 25 years. The creation of the Greater London Council in 1965 saw the number of LFB stations increase. The LFB absorbed some stations from the county brigades. At the time there were a handful of smaller brigades: Middlesex, Croydon, West Ham and East Ham - they were all incorporated into the LFB. 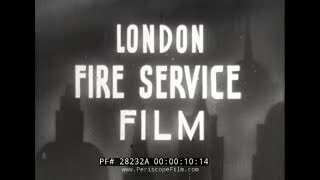 By 1965 the LFB had 115 stations, plus two river stations. Although no lives were endangered and a major incident was not initiated, the fire at the historic tea clipper Cutty Sark in May 2007 became a notable incident for the widespread interest of national media and the unusual circumstances - having been caused by an industrial vacuum cleaner inadvertently left switched on by renovation workers for 48 hours. Two fire appliances and an aerial appliance arrived at the scene within six minutes of the initial call to emergency services, and the commanding officer immediately requested an additional four appliances; firefighters brought the blaze under control within an hour. From 27 to 28 April 2007 London's busiest shopping area was closed whilst more than 100 firefighters tackled a large fire in a flat above a department store on Oxford Street. The clothing retailer New Look was later fined a record 400,000 for fire safety breaches. 1 October 1978 saw one of London's largest post-World War II fires, at The Granary warehouse on St. Pancras Way. At the first call at 2:58 a.m., three fire engines and a turntable ladder were sent to the scene. 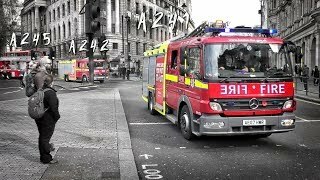 The scale of the blaze is evidenced by the rapid development of the LFB's mobilisation: make pumps four at 3:05 a.m.; make pumps six at 3:07 a.m.; make pumps 10 at 3:12 a.m.; make pumps 15 and turntable ladders 2 at 3:19 a.m.; make turntable ladders 4 at 3:39 a.m.; make pumps 20 and turntable ladders 6 at 3:51 a.m.; make pumps 25 at 4:19 a.m.; make hose layers 2 at 4:30 a.m.; and make pumps 35 at 5:13 a.m. At 4:50 a.m., the structure suffered a major collapse, killing firefighter Stephen Neill from Barbican station, seriously injuring three others, and destroying two fire engines. During the 1970s-1990s IRA bombing campaign throughout the last quarter of the 20th century, several major bombings were carried out in London by the Provisional IRA, including at the Palace of Westminster, Tower of London, and Harrods. A list of these and other bombings in London to which the LFB responded can be found here. Dudgeons Wharf on the Isle of Dogs contained a site of over 100 tanks of various capacities up to 20,000 gallons used for storing oils and spirits. A fire started when workmen were cutting up old oil tanks. The LFB was called - six pumps, a foam tender and the fireboat Massey Shaw - and while firefighters tackled the fire an oil tank exploded. Five firefighters from Millwall and Poplar stations were killed, the largest single loss of life in the LFB since the Second World War. London's Firefighters: Edited by David C Pike and published by Austin Macauley Publishers (ISBN 978-1-78455-541-2) in 2015. A wonderfully readable, lavishly illustrated anthology of articles, fiction and verse about the London Fire Brigade, much of it drawn from the award-winning in-house magazine 'London Fireman' (1966-82) and 'London Firefighter' (1982-2005). The book celebrates the forthcoming 150th anniversary of London's fire brigade's (1866-2016) by delivering both a comprehensive history of the London Fire Brigade and provides a fascinating portrait of individual firemen and firewomen at work and (occasionally) at play. The numerous, often highly dramatic illustrations, many from the London Fire Brigade and the Mary Evans Picture Library  offer a lively commentary on the text. ^ a b c "Who we are". London Fire Brigade. Archived from the original on 19 May 2011. Retrieved 2015. 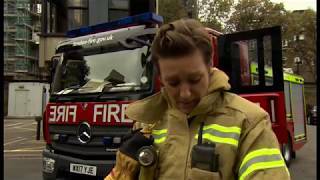 ^ a b c "First woman takes over at London Fire Brigade as chief retires after almost a decade". London Evening Standard. Archived from the original on 30 December 2016. Retrieved 2016. ^ a b "LFEPA" (PDF). www.london-fire.gov.uk. Archived (PDF) from the original on 11 June 2017. Retrieved 2018. ^ "News". www.london-fire.gov.uk. Archived from the original on 13 August 2017. Retrieved 2018. ^ General introduction', Survey of London: volume 26: Lambeth: Southern area (1956), pp. 1-17. 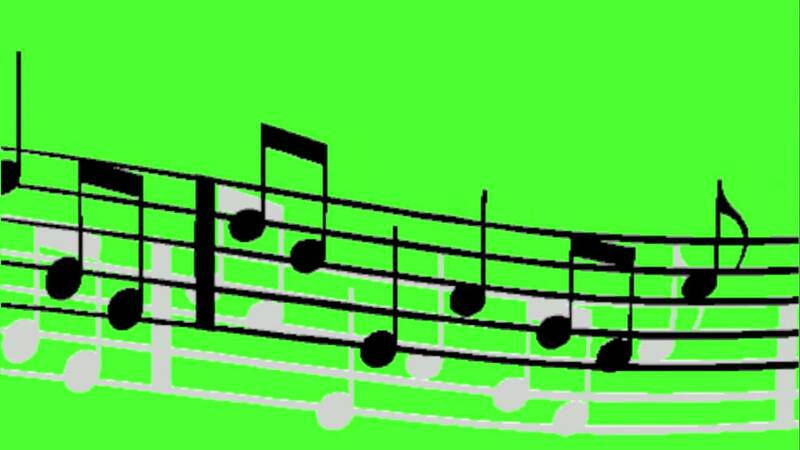 Archived 5 June 2011 at the Wayback Machine Date accessed: 27 March 2010. ^ "LFB Firefighter Recruitment - a Freedom of Information request to London Fire Commissioner (London Fire Brigade)". whatdotheyknow.com. 4 December 2016. Archived from the original on 18 January 2017. Retrieved 2018. ^ "Little squirts to the rescue - The Sunday Times". thesundaytimes.co.uk. Archived from the original on 21 February 2014. ^ "News". www.london-fire.gov.uk. Archived from the original on 1 November 2017. Retrieved 2018. ^ "Fire Training Systems - Bespoke Fire Training System". Process Combustion. Archived from the original on 12 July 2012. ^ "Firefleet.co.uk - Stations/Manchester Square 1889 color fire station". firefleet.co.uk. 4 May 2007. Archived from the original on 4 May 2007. Retrieved 2018. 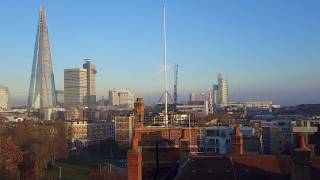 ^ "Firefleet.co.uk - Stations/Barbican fire station". 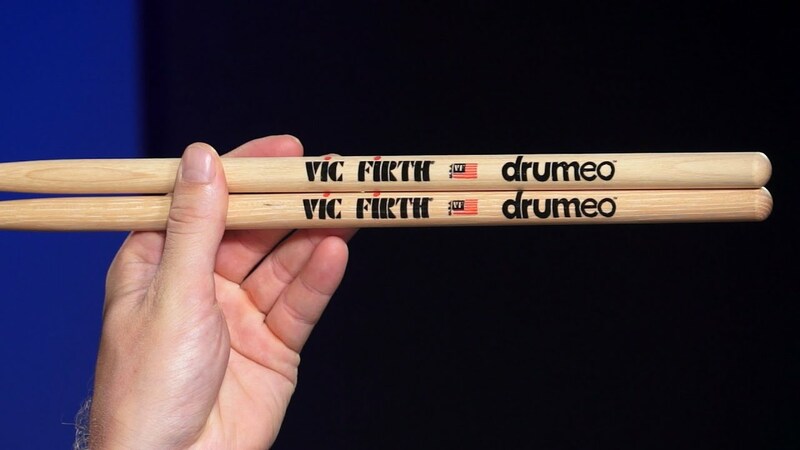 firefleet.co.uk. 4 May 2007. Archived from the original on 4 May 2007. Retrieved 2018. 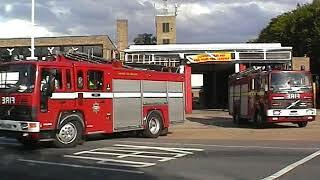 ^ "Firefleet.co.uk - Stations/Shooters Hill 1912 fire station". firefleet.co.uk. 4 May 2007. Archived from the original on 4 May 2007. Retrieved 2018. 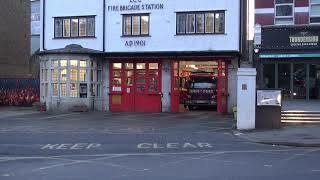 ^ "Firefleet.co.uk - Stations/Sanderstead 1935 fire station". 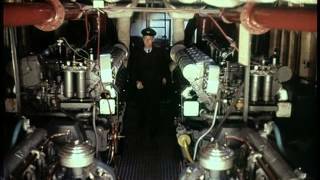 firefleet.co.uk. 4 May 2007. Archived from the original on 4 May 2007. Retrieved 2018. ^ "Incidents". www.london-fire.gov.uk. Archived from the original on 2 November 2017. Retrieved 2018. ^ "Incidents". www.london-fire.gov.uk. Archived from the original on 31 May 2017. Retrieved 2018. ^ "BBC NEWS - UK - England - London - Blaze ravages historic Cutty Sark". BBC News. Archived from the original on 23 May 2007. ^ "BBC - Beds Herts and Bucks - Read This - Depot explosion". Archived from the original on 15 July 2006. ^ "BBC ON THIS DAY - 7 - 2005: Bomb attacks on London". BBC News. Archived from the original on 10 June 2009. ^ "BBC ON THIS DAY - 5 - 1999: Death toll rising in Paddington crash". BBC News. Archived from the original on 7 March 2008. ^ "BBC ON THIS DAY - 8 - 1991: One dead as train crashes into buffers". BBC News. Archived from the original on 8 January 2008. ^ "BBC ON THIS DAY - 20 - 1989: Marchioness river crash 'kills 30'". BBC News. Archived from the original on 7 March 2008. ^ "BBC ON THIS DAY - 12 - 1988: 35 dead in Clapham rail collision". BBC News. Archived from the original on 7 March 2008. ^ "BBC ON THIS DAY - 18 - 1987: King's Cross station fire 'kills 27'". BBC News. Archived from the original on 27 June 2007. ^ "Hampton Court Palace blaze recalled 30 years on after fire ripped through historic building". Get Surrey. Retrieved 2018. ^ "BBC ON THIS DAY - 28 - 1975: Horror underground". BBC News. Archived from the original on 20 June 2017. ^ Clark, Neil (28 November 2016). "Crystal Palace burnt down 80 years ago today". Daily Express. Retrieved 2018. ^ "Exercise Unified Response". Archived from the original on 27 July 2016. Retrieved 2016. ^ (http://www.maryevans.com), Mary Evans Picture Library, London. "Mary Evans Picture Library. Historical images. Historical archive. Images of history. Images. Pictures. History. ILN. Stock. Photos Fine Art. Illustrations". www.maryevans.com. Archived from the original on 8 December 2017. Retrieved 2018. 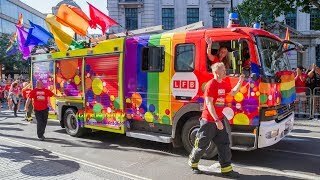 Fire & Rescue , Ambulance and Police at Pride In London 2017 parade! [Special Call!] 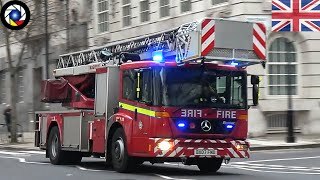 London Fire Brigade - Mk2 pump A212 LFB Paddington Responding + On Scene!